FebriDx from Andrew J. Schuman on Vimeo. Is there a FebriDx in our future? Physicians don’t want to overlook a serious bacterial infection that may cause prolonged illness, disability or death, yet we realize that antibiotics are overprescribed. Over prescription encourages bacterial resistance, and over time if we are unable to curtail their use, our antibiotics may lose their efficacy. How does a pediatrician determine if an infection is caused by bacteria or virus? Clinical signs and symptoms often cannot distinguish between the two etiologies. 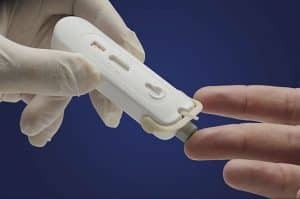 Medical technology can be helpful as rapid point of care (POC) assays can quickly identify patients with strep, influenza and RSV. An infiltrate on CXR cannot distinguish viral vs bacterial pneumonia. Ancillary testing may be helpful. An elevated WBC with a preponderance of neutrophils favors a bacterial etiology, as does an elevated c reactive protein (CRP), an acute phase reactant. But wouldn’t be nice to have a quick, affordable, point of care that will help distinguish viral from bacterial infections? Such an assay could provide reassurance and guide further workup. In Britain, the National Institute for Health and Care Excellence (NICE) has developed straightforward guidelines for treating adults with lower respiratory tract infections. A point of care CRP (none are CLIA waived in the US), is performed in adults with lower respiratory tract infections if a diagnosis of pneumonia has not been made. 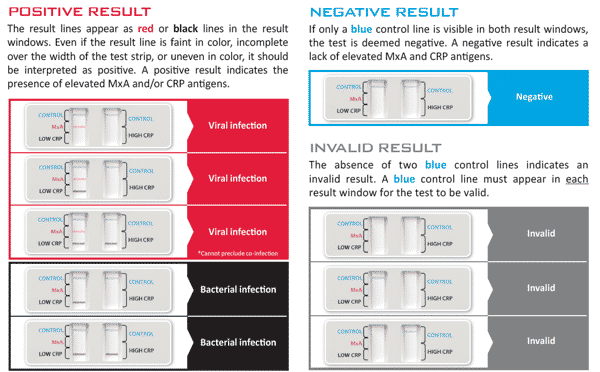 According to NICE, antibiotics are not indicated if CRP level are less than 20 mg/l, are recommended if levels exceed 100 mg/l, and may be considered if levels fall between these values if symptoms worsen. A biotech company, RPS Diagnostics, has developed a novel test that combines a POC CRP assay with and assay for myxovirus resistance A protein (MxA) – an intracellular protein that becomes elevated in the presence of acute viral infection. 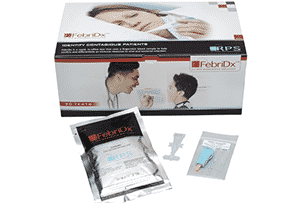 The test is called FebriDX, and is not commercially available at this time. The assay will undergo clinical trials in Britain and Canada and will eventually be evaluated by the Food and Drug administration for CLIA waived status in the USA. In its present form FebriDx is a card based assay, that requires pipetting fingerstick blood into two separate areas of a test strip, closing the test cartridge and adding buffer solution to another area of the test card. Results are available in 10 minutes and indicate the likelihood of an infection being viral or bacterial based on the MxA and CRP results. RPSDiagnostics has recently partnered with an Australian biotech company, Atomo Diagnostics, to modify FebriDx from a test card assay to a cartridge system that incorporates an in-built safety lancet, calibrated blood collection and delivery system, and integrated push-button buffer delivery mechanism to help prevent user-related errors and improve test performance (see FebriDx – part 2). Can’t wait until this is available.